Intersecting a figure and a table blurs the question of where one stops and the other begins. 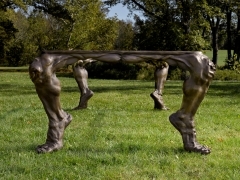 Powerful over-life-size human legs transform the table into an “other”. The toes, the only grounded foot parts, seem dancing, but pointing in different directions, they also present a dynamic conflict. The table becomes a metaphor for serving others, which is seldom struggle-free. 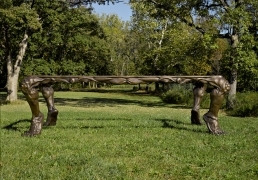 The table and the figure continue to move into each other’s territory. 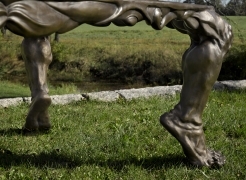 The legs flow upward into a rectangular frame assembled of stylized intimate body parts. But as the legs are masculine, the parts that emerge above are feminine. The merging of both genders extends the dialogue and broadens the possibilities, adding an element of mystery to the thought-provoking concept.